Fall is the apple of our eye. It’s that time of year when the best flavors become more readily available: pumpkin, maple and of course apple! Our produce is delivered fresh daily to stores, so stock up on apples when you shop. Apples are so versatile and we carry multiple varieties to give you new ways to enjoy the season’s flavors. We carry Red Delicious, Fuji, Gala, Honeycrisp, Pink Lady and Granny Smith. 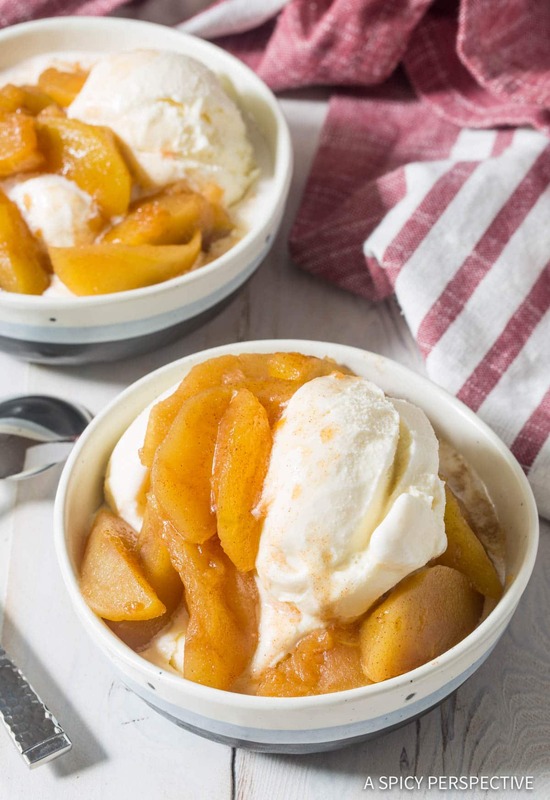 You’ll want plenty of produce to make these apple recipes created by our influencer partners. 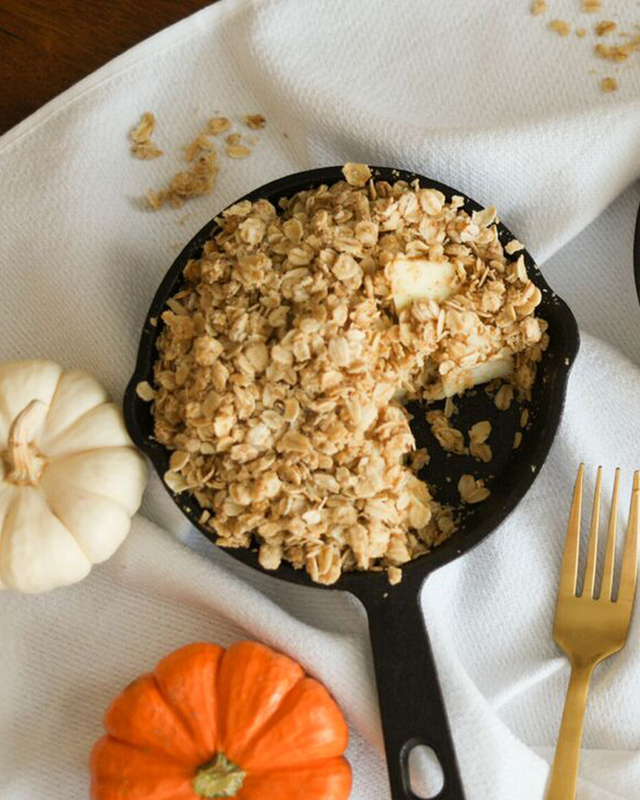 Kate Bryan, of The Small Things, uses our Crofton Mini Cast Iron Cookware ($4.99) to cook cute Mini Apple Crisps. This cookware, available 12/5, can go straight from the stove to the table and the size is ideal for single-servings. Her recipe makes two six inch, or one large ten inch, apple crisp(s). Whether you decide to make these for breakfast or for dessert, these apple crisps are a delicious way to welcome fall. These mini apple crisps are big on flavor. Photo courtesy of Kate Bryan of The Small Things Blog. If you missed out on the pressure cooker that was on-sale in August, we have good news! During the week of 12/5, our Ambiano 9-in-1 Programmable Pressure Cooker ($59.99) hits shelves. It has an eight quart capacity and nine program settings. The recipes below are meant for pressure cooking in order to cut down on cooking time. 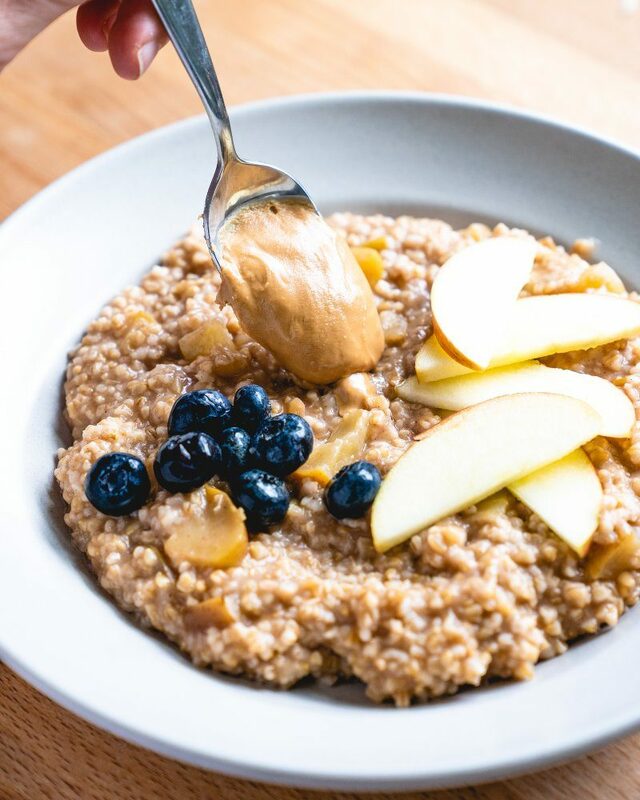 These Apple Cinnamon Pressure Cooker Steel Cut Oats are creamy in consistency and will keep your family full for the morning ahead. Sonja and Alex Overhiser of A Couple Cooks use our Millville Steel Cut Oats and explain why they recommend steel cut over rolled oats. This plant-based recipe requires minimal cooking time and there is plenty made in one batch, allowing for leftovers depending on the size of your family. The pressure cooking time of this recipe is only four minutes. You will have to wait for the pressure cooker to heat up and cool down/release steam, but most of the process is hands-off! Pour our Simply Nature cashew butter over steel cut oats. Photo courtesy of Sonja and Alex Overhiser of A Couple Cooks. By now, you’ve probably noticed a trend in both of these recipes. They all call for cinnamon. Cinnamon is a fantastic fall spice because it’s both sweet and spicy, which makes us think of cozy days. In this Pressure Cooker Spiced Apples recipe from Sommer of A Spicy Perspective, she infuses the apples with cinnamon and our Seasonal Nature’s Nectar Apple Cider ($3.49) while they cook to tender perfection. As Sommer mentions in her recipe, be sure to use a firmer variety of apple, such as Granny Smith or Honeycrisp. The outcome will be soft apples that can be used for topping meat, ice cream or pie. These spiced apples only take a minute to cook. Photo courtesy of Sommer of A Spicy Perspective. Savor all of the apple goodness this season. Also, if you want additional pressure cooker recipes that are not centered on apples, be sure to read our earlier blog post. Let us know what you think about these recipes in the comments below! Apples on Cream of Wheat for breakfast are awesome. Are you going to bring back the breakfast cereal, Cream of Wheat? Haven’t seen it this year in Wisconsin. Hi, Jean. We don’t have this right now, but keep checking our weekly ads to see if we bring it back! It’s not gigantic and would be perfect for Aldi. Any comments on that possibility?